We all go through shifts in life that often can cause disbalane in our energy centers. To help you cope with life stressors and challenges, essential oils can serve as a great natural remedy and aid to our energy centers (chakras) all 7 of them (i am not going to discuss the higher hakras). 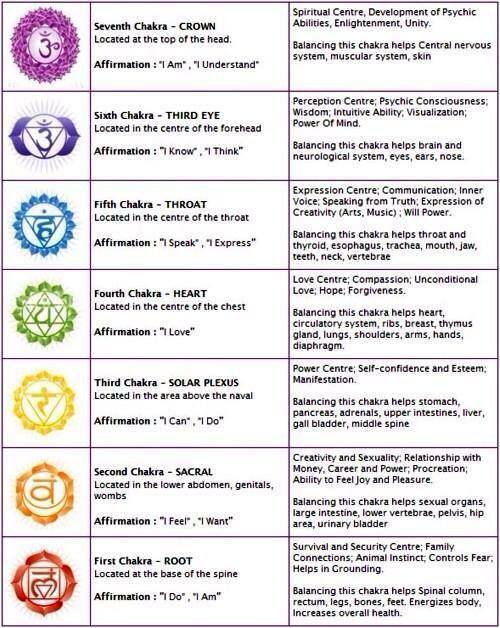 Each chakra is related to the physial body, which will be shown in the chart below. This chart will help you choose the oils you need for each chakra and the color associated with it. Using crystals and tunning forks or crystal or tibetan bowls can help you tune the chakra even more efficiently. Using essential oils above dilluted with the carrier oil, in the form of body oil or body perfume is one of the easiest and best ways to delivery these high frequency natural substances to your body. In 4oz of carrier oil 7 drops of each! Enjoy, the aroma is simply DEVINE! NAMASTE! LOVE LIGHT AND PEACE!